Hello friends, Happy Hump day. Hope you are having a great start to your Wednesday. I am sharing a card using a new stamp company to me, Stamp Anniething. I am using Dean-You are so cool and yes he is a cool dude. I colored the image using copics and cut him out using the brother scan and cut. I used a brick wall stencil from MFT and distress oxide inkS to create the wall background. I used the fancy frames from craftin desert divas to layer on the front panel. I then added the sentiment from the stamp set to the bottom of the card. Well that's all I have for you today, thanks for stopping by. Hope you have a great rest of your day and we will chat soon. Hello friends, Happy Tuesday to you! Today over at Crafty Sentiments Designs we have a new challenge going on. 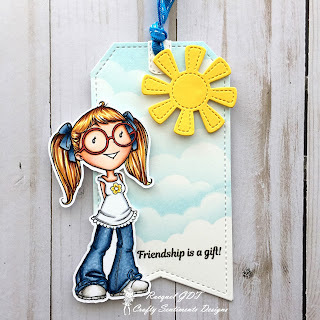 This week is anything goes and I created a tag using Friendships. I colored the image using copic markers and cut her out using my brother scan and cut. 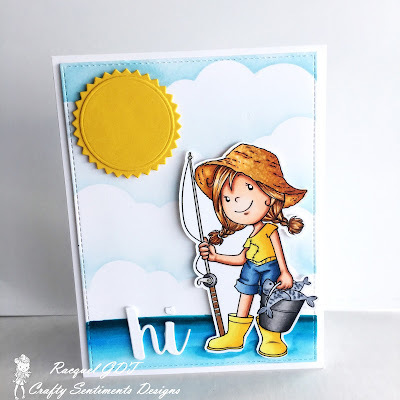 I die cut a tag out and used distress inks to create the clouds in the background. I then die cut a sun out and attached it to the tag. I stamped the sentiment at the bottom of the tag. It was the right sentiment for this tag. That's all I have for you today. Check out Crafty Sentiments Designs blog to see what the other talented ladies created for the challenge. Have an awesome day! Hello friends, Happy Sunday to you. 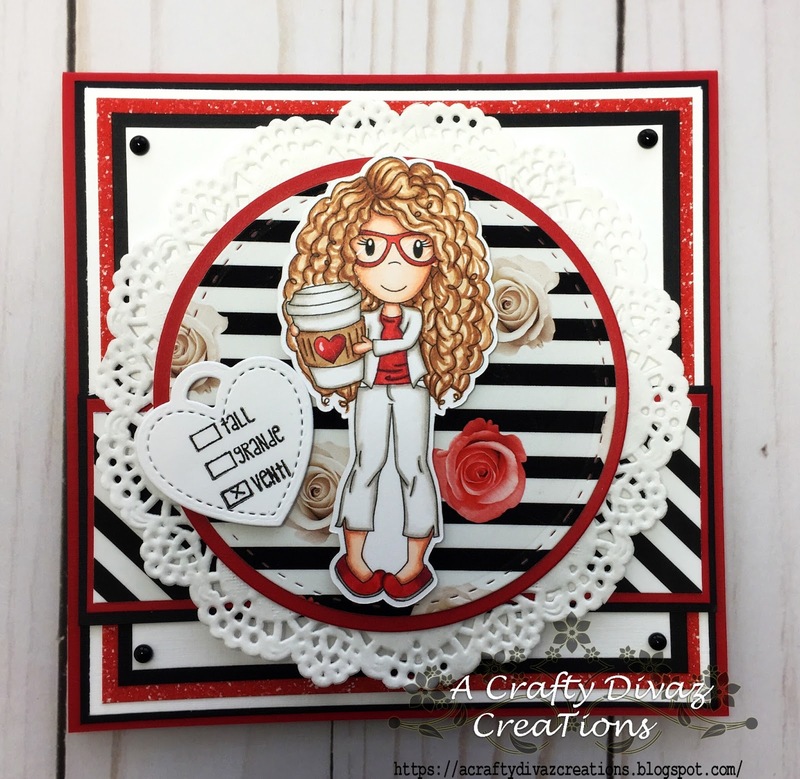 Thanks for stopping by, I am sharing a card using Avery with Coffee. She is one of my favorite images in the store. I am a huge coffee addict and when Christine released her earlier this year I was super excited. She comes with or without glasses so you have an option on which you prefer. I decided to select with glasses. I created this card using digital papers which you can find here. I colored Avery using my copics and cut her out using my brother scan and cut. I die cut a heart out and added the sentiment. I love the way this card turned out, make sure you pick her up in the shop. 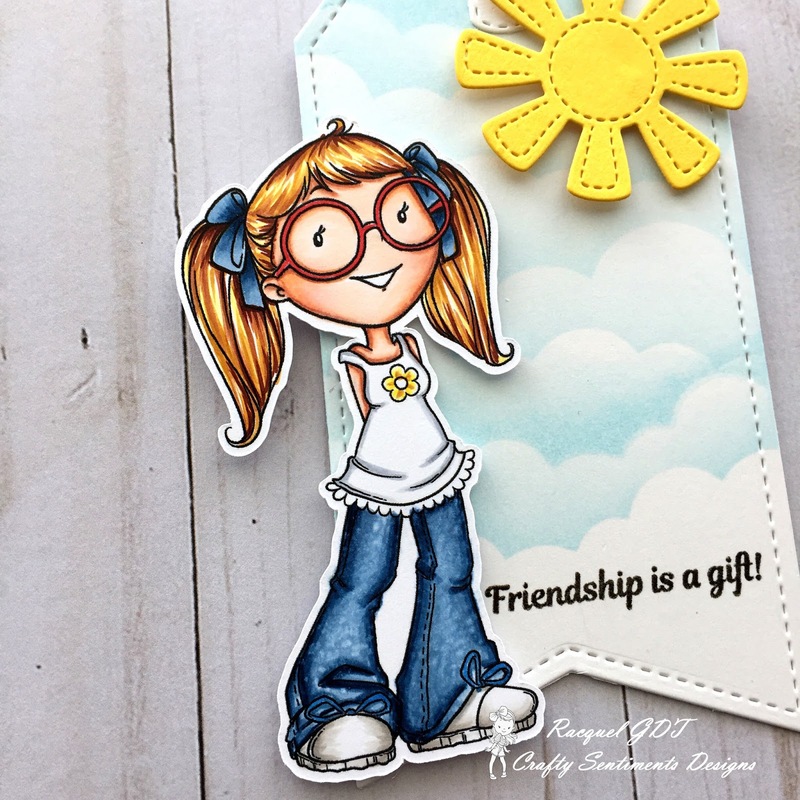 That's all I have for you today, don't forget to stop by Christine's shop to check out this and other cute stamps. Have a great weekend and we will chat soon. Hello friends, Happy Thursday to you. 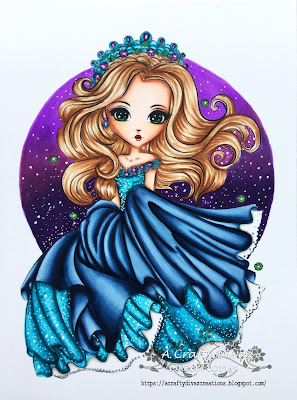 Thanks for stopping by I am sharing a card using Angels Hearts and Memories Barbie Qutie. She is ready for a serious cook-out. 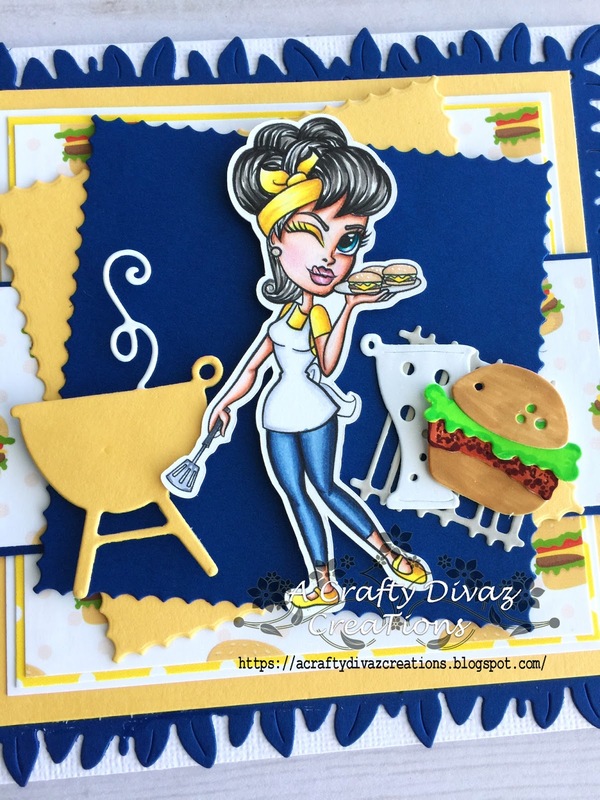 I love this card, a cookout for the summer is definitely what I need. Check out Angela's store, she is having a sale on all of her images. That's all I have for you today, thanks for stopping by. Have a awesome Thursday! Hello friends, thanks for stopping by. 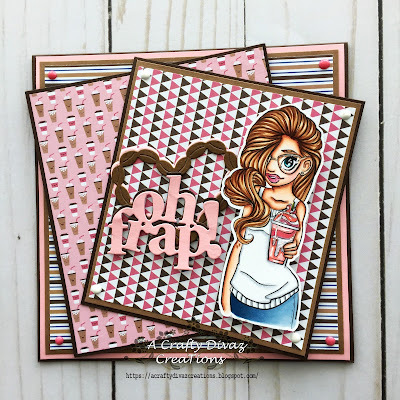 Today I have a card share using the new Make it Crafty Frappe Delight. Anyone that know me also know I am a huge Starbucks fan. Anytime I see a stamp that is coffee related, I get excited. This was no exception, as soon as I saw this cutie I rushed right over and purchased her. I colored the image with my copics and cut her out using my brother scan and cut. I used Sugar Pea Designs coffee paper stack to create the card. 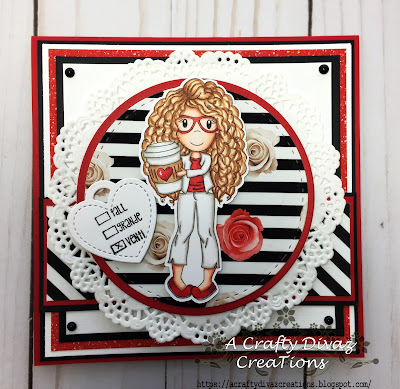 I die cut the heart coffee bean die from LaLa Land Crafts die and added it to the front of the card. 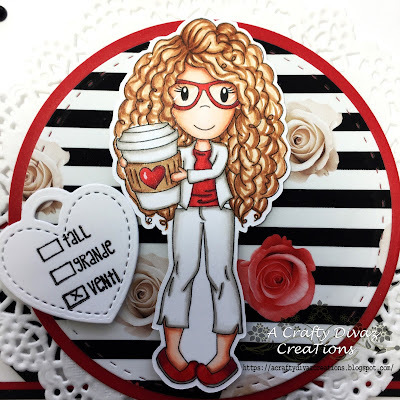 I layered oh frap die cut from stamploration in front of the coffee bean Heart diecut. I then added the image to the card front. I love this image and glad I picked her up. Thanks for stopping by today, have a great rest of your day! Hello friends, Happy Monday to you. Hope you had a great weekend and you were able to get some crafting in. 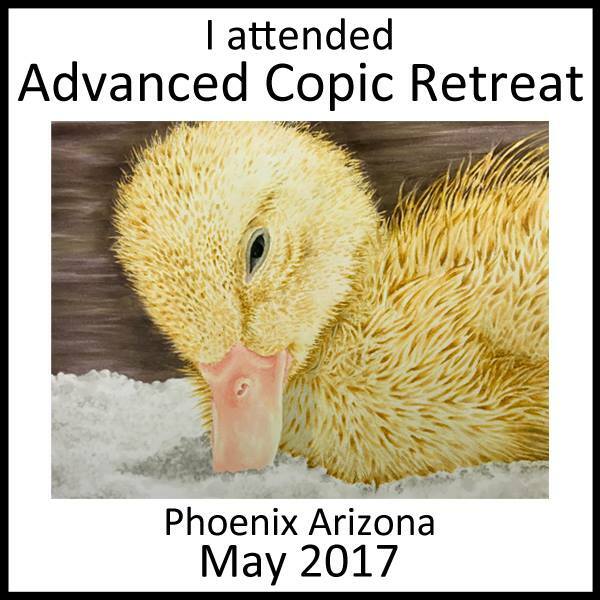 I had some time this weekend to create some cards using a new stamp company to me. 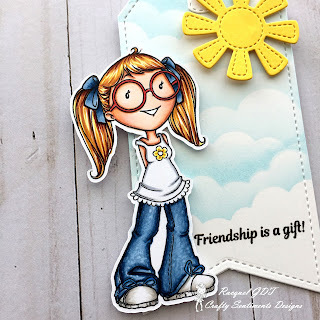 I decided to purchase a couple of Stamp Anniething stamps and I have to say I just love them. I decided to color up Vanessa-Coconut Drink first and what can I say. I am in love with this cutie. 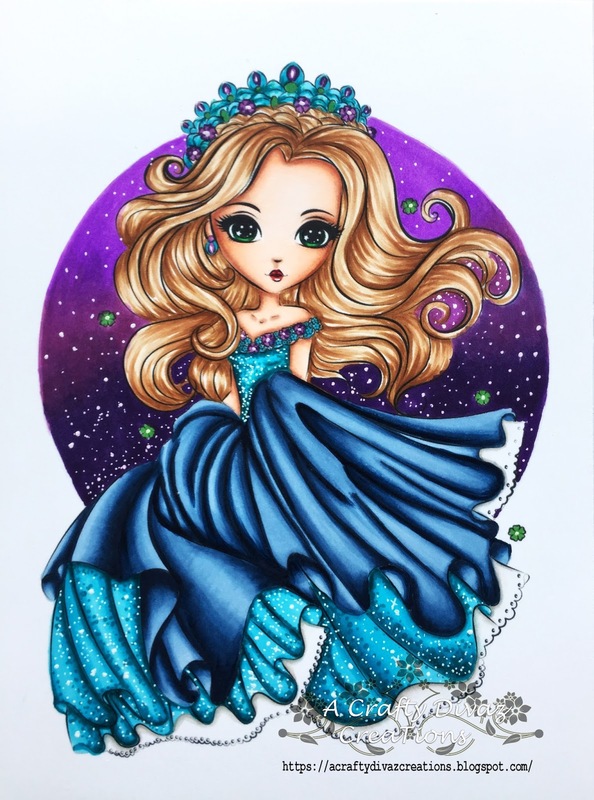 I colored her up using my copics and cut her out using my brother scan and cut. 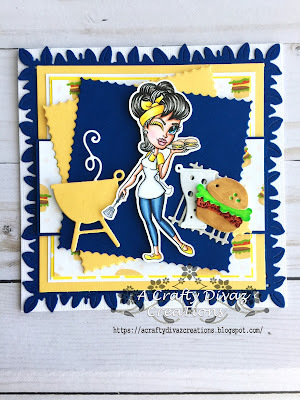 I wanted to create a shaker card using this cutie. It just reminds me of the summer and being in the tropics. Oh so refreshing for sure. I am definitely late to the party, loving these stamps. That's all I have for you today, thanks for stopping by. Have a awesome Monday! Hello Friends, thanks for stopping by today. It's Tuesday and you know what that means. 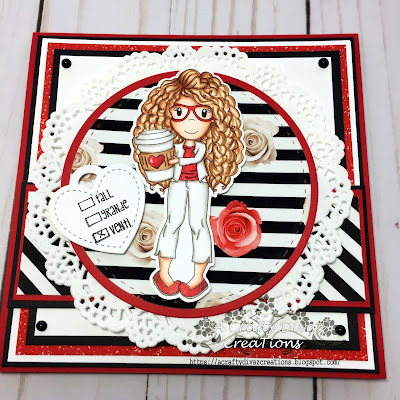 Another challenge going on at Crafty Sentiments Designs. This week's challenge is all about, the sun, beach, and sand. 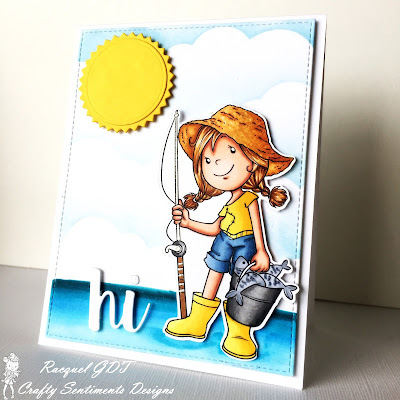 I created a scene card using this cutie, Isobel a good catch. I used a cloud stencil and tumbled glass distress ink to create the cloud background. I used my copics to add the ocean to the card front. I colored the image using my copics and cut her out using my brother scan and cut. I cut the card panel out using a stitched rectangle die from my stash. I cut the sentiment out from a word die from my stash as well. 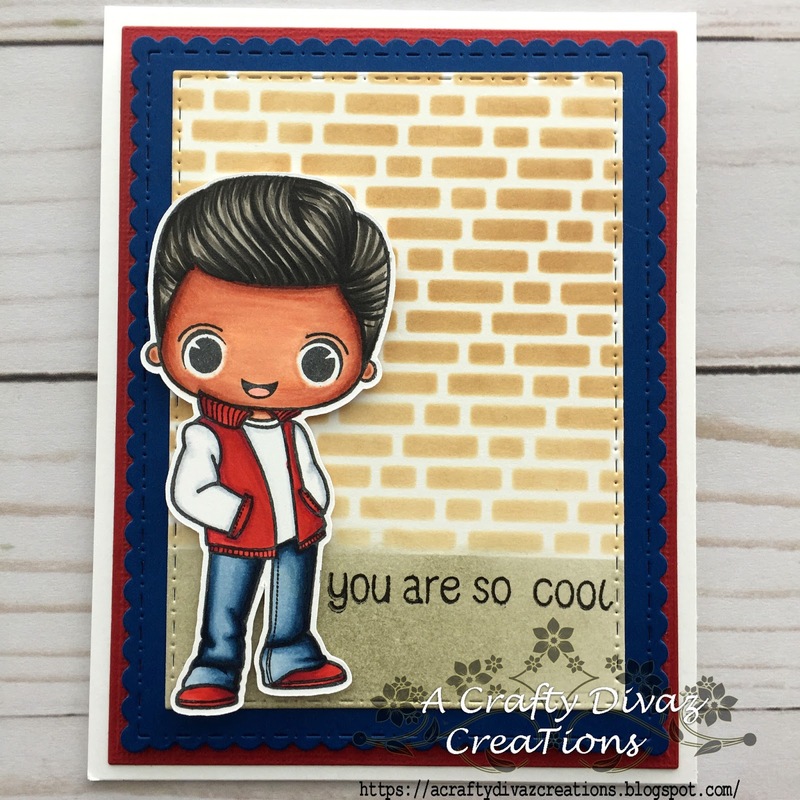 This card is so cute, make sure you check out what the other design teammates created over on the blog. That's all I have for you today, thanks for stopping by. Have a awesome Hump Day and we will chat soon. Hello friends, Happy Saturday to you. I hope your weekend is off to a great start. 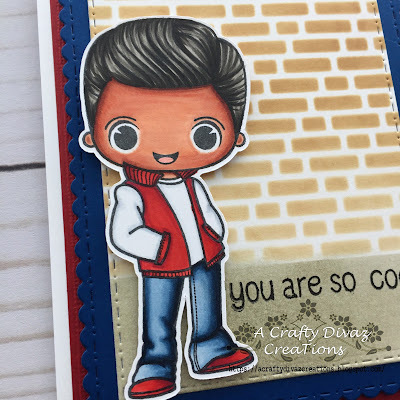 Thanks for stopping by, today I am sharing a card using this month's new release Holiday Gifts Avery from the Papernest Dolls. It's Christmas in July, and I am getting a head start on my cards. This cutie is ready to drop off gifts to good girls and boys. I decided to make a winter shadow box card using this cute image. I colored the image using my copics and cut her out using my brother scan and cut. I die cut the tree, ice border, snowflakes, stitched hillside, and lamp out of white card stock. I used some silver vinyl to layer behind the lamp for added dimension. 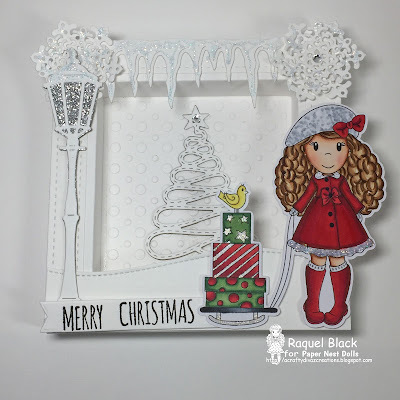 I used a falling snowflakes embossing folder to emboss the inside of the shadow box. I cut out the sentiment using a banner die from my stash. I love the way this card turned out. I am not ready for Christmas but I am getting a head start on my Christmas cards. That's all I have for you today, thanks for stopping by and have a great weekend. Hello friends, hope you are having a great day. We are celebrating the 4th of July here in the states. I will be catching some fireworks later, love the fourth. Today I have a card to share in honor of the holiday. I am using Patriotic Angela from Angels Memories and Hearts. I decided to use doodle bug designer papers to create this card. I colored the image using copic markers. 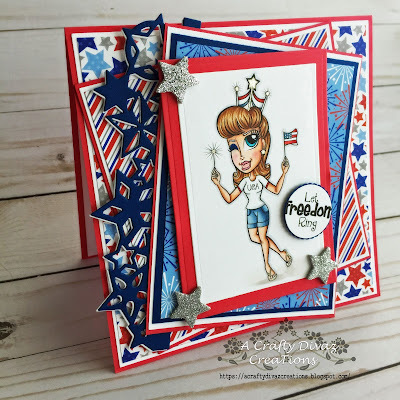 I die cut the star border from a die I have in my stash. 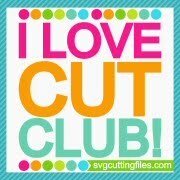 I cut the sentiment out using a circle punch and layered a scalloped circle behind it. I added some dimensional stars around the image. I love the way this card turned out, if you love this image make sure you check out Angela's store on etsy. She is having a great sale on her digital images. Thanks for stopping by, I am off to enjoy some bar-b-que and fireworks. Have a great rest of your day and we will chat soon.